Out of Stocks Reduced by 60%; As Software Gets Easier, will More Mid-Market Companies Upgrade their Supply Chain Tool Sets? What do you do if you are a fast growing mid-size company and find that supply chain planning challenges are one of the real constraints on your ability to continue to profitably grow? You quickly do something about it, of course, and implement new planning technologies and processes that solve the immediate business challenges while creating a platform for long-term growth and success. The results have also showed up very rapidly as well. Out-of-stocks have decreased from about 5% before to just 2% today, even as inventory levels have stayed flat. That's what Goya Foods did, as detailed by executive vice president Peter Unanue, grandson of the Hispanic food firm's founder, on a recent Videocast on our Supply Chain Television Channel. Goya Foods, founded in New York City in 1936, is enjoying its 75th anniversary this year, and has demonstrated a consistent track record of success. Goya sells a wide variety of Hispanic and Latin foods throughout North and South America, and is both the largest Hispanic-owned food company in the US and tops here in market share, with sales now at about $1 billion annually. But with that growth came added business and supply chain complexity. One challenge is that even similar food products might need to be slightly tailored for different markets, and many markets have demand for goods unique to where the majority of their immigrant population locally has come from. So even just one city may have neighborhoods that are primarily Mexican , others with a Cuban heritage, etc., each wanting specific products that they are familiar to them from their home countries. That tailored approach, plus overall business growth, led to an explosion of SKU counts in recent years at Goya, now to over 1600, up 60% in the last five years. The SKU and overall volume growth put pressure on forecasting, inventory management, supply management, and many other areas of the supply chain, according to Unanue during the broadcast. But that SKU growth is also a key factor in Goya's success, he said. "It has added some complexities, but it's really also a competitive advantage. Having the right mix of product in each neighborhood allows us to maximize our sales," he said during the broadcast, noting interestingly that the company has many immigrant workers at its plants and DCs and often uses them for help in product development for new products targeted at immigrants from different countries. (To see the full Videocast, go here: Goya Foods Continues Profitable Growth with Support of New Supply Chain Planning System). The problems stemming from the growth in sales and SKU counts popped up in several different ways. The company's supply chain network grew in scope and complexity, now encompassing six manufacturing plants and 11 distribution centers. Service levels to retailers began to drop into the mid-90s in percentage terms, several points below where customer-service focused Goya wanted to be. Supply chain managers were spending too much time on manual processes that the company knew could be automated, not leaving enough time for strategic activities. "Service is very important to our company, and that's where we started to notice with the growth in SKUs, the number of facilities, and the volume it became increasingly challenging to manage the inventory levels necessary to provide good service," Unanue said. He added that starting as a smaller company and growing into a mid-size enterprise, Goya had a bit of a traditional of using manual processes and "seat of the pants" decisions that might have worked a decade ago, but could not keep up with the demands the company faces today. Recognizing this growing constraint, Goya took some time to really look at its business and where it was headed, and then identified gaps in its supply chain processes and technology. That led to plans for major technology overhaul to be implemented over five years, including a new ERP, new Warehouse Management System, and new Transportation Management System to manage inbound freight. But, Unanue says, the team saw the biggest benefit would come from improving the company's planning tools and processes, and so it decided to begin the technology transformation with new software in that area before anything else (see graphic below). "The areas we found would be most impactful were new tools in demand planning, order fulfillment, and replenishment, and the need for better demand planning especially rose very quickly, " he said. Goya's analysis said that "better demand planning and fulfillment would provide us with the most benefit in the least amount of time," Unanue added, saying that the company decided it could push off the ERP system implementation for later. The company looked at several alternatives for new supply chain planning software, and ultimately selecting a set of tools from JDA Software. 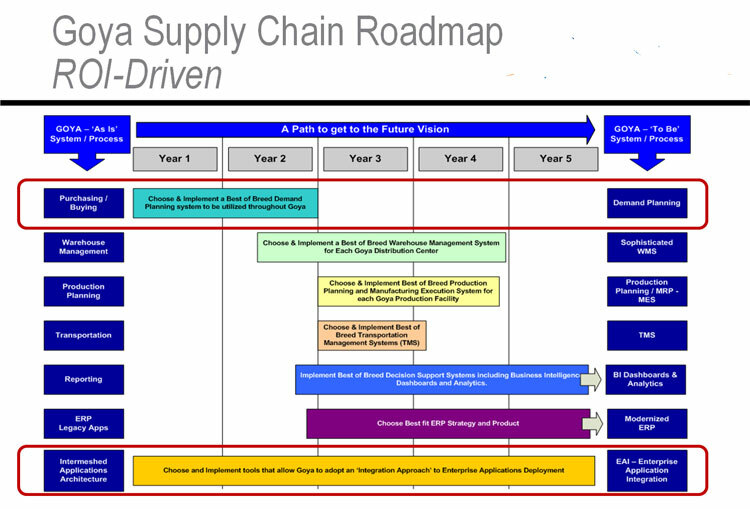 Specifically, the company implemented four modules from JDA: Demand (demand planning/statistical forecasting), Demand Classification (tailors the right forecasting algorithms to the right SKU/product families); Fulfillment (integrated inventory plans based on customer demand and requirements, lead times, etc. ); and Order Optimization (creates optimal vendor order plan based on inventory and production plans. Together these tools allowed Goya to improve a number of business processes, which in turn led to improve supply chain results. Forecasts that uses to be based on "moving averages" became sophisticated statistical forecasts with "automated tuning." Spreadsheet-based inventory planning became powered by sophisticated decision-support tools. Disjointed forecasting processes throughout the company moved to a "one number" forecast to drive the business. The process for ordering from vendors went from a time-consuming 20-30 minute effort to just seconds in many cases. Above, you will find a brief except from the full Videocast, in which Unanue discusses these process improvements Goya Food enjoyed as a result of the new software deployment, and view comments from JDA Software's Danny Halim describing how getting to a one number forecast paradigm can often be a challenge even for mid-market companies. Goya choose to pursue a phased but aggressive roll-out plan for the new planning tools, starting with facilities near its New Jersey headquarters but then rapidly expanding from there. The initial deployment took about 8 months including integration work, but the rest of the network was brought on board very rapidly thereafter. The results have also showed up very rapidly as well. Out-of-stocks have decreased from about 5% before to just 2% today, even as inventory levels have stayed flat. That not only has improved customer service to retailers, but led to a nice bump in total sales. Goya has also seen significant improvements in productivity throughout many areas of its supply chain processes, especially in purchasing, and has seen increases in the amount of trailer capacity they are achieving for vendor inbound shipments, among a number of other benefits. Goya is also now leveraging its full buying power across all locations to achieve better net pricing from vendors. "The ROI [from the planning tools] has worked out very, very favorably," Unanue said. He adds that after improving service levels without increasing inventory in phase 1 of the project, in phase 2 Goya plans to keep the higher levels of service but now drive down inventories, noting for example that the new tools help Goya better understand vendor lead time variance and show where safety stocks can be reduced for goods and commodities from highly reliable vendors. JDA's Halim says Goya Foods is part of a growing number of mid-market companies are now looking at these kinds of planning tools, especially as the cost and complexity of the software been reduced, making it now within the capabilities and budgets of many mid-market firms. He also said that the availability of "cloud-based' solutions is an important part of that market change. "The interest is really there from mid-market companies that have the initiative and the strategic vision about how they are going to grow their businesses," Halim said. What's your reaction to the Goya case study? Are you seeing a combination of factors leading more mid-market companies to adopt this type of advanced technology? Is the cloud key? What has been you experience? Let us know your thoughts at the Feedback button below.